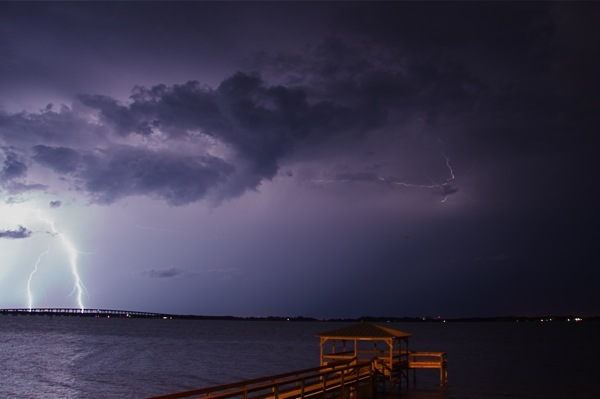 The view last night over the Indian River, with a pier jutting over the water at Palm Shores Park. 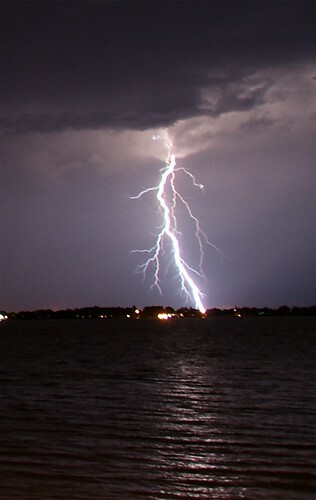 This shot was a little overexposed because two large bolts struck in the same portion of the image. On Monday night, I noticed the lightning out my window. Last night, I heard a low rumble, like a plane going overhead. I didn't think much of the noise, though I knew it was a distant thunderstorm. Fifteen minutes after I heard it, I finally went outside my apartment to check out the situation. 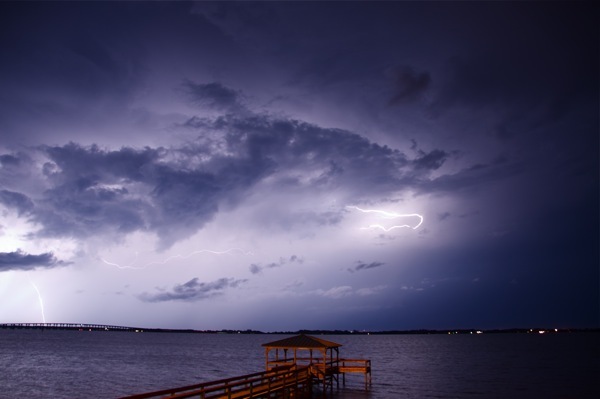 Lightning was flashing brilliantly to the northeast. I probably had missed a lot already, so I grabbed my equipment, checked to see where the storm was on the radar, then sped off. I'm waiting for the day when I get arrested while trying to take photos. I'm becoming personally notorious - infamous among me, myself and I - for going to city parks after hours. So far, I have escaped police detection. Last night, I set up my tripod in the parking lot of a roadside park in Palm Shores, where I shot the liftoff of shuttle Discovery in mid-March. Like many small parks in the area, it's only open during daylight hours. But I didn't care. It's next to the Indian River, with the Pineda Causeway in the distance - decent foreground for the location of this storm. A light rain was falling, so I took off my overshirt and draped it over my camera. The shirt also helped block light from entering the viewfinder from behind the camera. And I placed the collar around the end of the lens, blocking excess light from streetlamps along U.S. 1. Again, I swear I missed the best lightning. Those bolts struck or crawled across the sky between exposures or when I was adjusting my tripod. Nevertheless, I got some interesting shots. 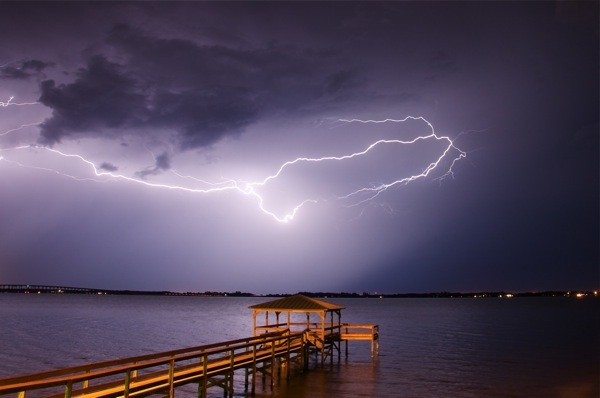 The weather in Central Florida has become increasingly hot and humid in the past week, sprouting such storm systems. I hope the trend continues throughout the summer, especially when the storms happen on my days off. This is looking eastward toward Satellite Beach and the southern part of Patrick Air Force Base. Life is exciting in Palm Shores. Only on the weekends - my weekends.